How much is Theo Walcott Worth? 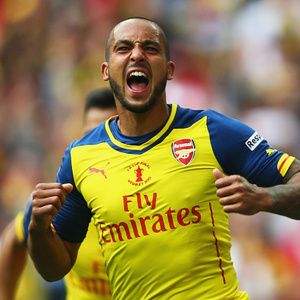 Theo Walcott Net Worth: Theo Walcott is an English footballer who has a net worth of $30 million. Born Theo James Walcott on 16 March 1989 in Stanmore, London, England, he plays as a forward for the Premier League club Arsenal and the England national team. A creation of the Southampton F.C. Academy, Walcott made his career beginnings with Southampton before fully exposing his talents with Arsenal. Once he joined the Premier League team for a fee of £5 million in 2006, Walcott went on to become England's youngest ever senior football player aged 17 years and 75 days. Thanks to his swift ball crossing, Walcott caught the attention of his manager Arsène Wenger who let him play as a wing before finally granting him the position of a striker in 2012. When it comes to his international career, Theo Walcott has joined the crew of the England national team representing the country at the 2006 World Cup and Euro 2012. He has acquired 36 caps and scored five goals in the process.